cooling pack chamber and one-piece molded plastic body. and 96 well slides and maintain correct position during electrophoresis. Available with area specific power supply. gained importance in the fields of genetic toxicology and human biomonitoring. damage, UV damage, and radiation damage. Immunological assays for DNA photoproducts provide a rapid means to quantitate photodamage in DNA. Photochemical damage is considered to be an important factor in the development of skin cancer. Sensitive immunological methods that detect individual DNA adducts facilitate the study of the biological significance of DNA lesions. Trevigen’s monoclonal UVssDNA antibody (clone C3B6) (cat# 4350-MC-100) detects (6-4)-dipyrimidine photoproducts. Specificity has been demonstrated for (6-4)-dithymidine, whereas the (6-4)-dicytidines or cyclobutadipyrimidines are not recognized. A low level of cross reactivity was observed with repeating (6-4)-thymine/cytidines within an oligonucleotide sequence. The UVssDNA clone C3B6 antibody recognizes (6-4)-dipyrimidines in single stranded DNA at least 4 nucleotides long. Apurinic/apyrimidinic (AP) sites are one of the major types of DNA lesions formed during the course of base excision and repair of oxidized, deaminated or alkylated bases. It has been estimated that about 2x105 base lesions are generated per cell per day. The level of AP sites in cells can be a good indicator of DNA lesion and repair against chemical damage and cell aging. The DNA Damage Quantification Kit utilizes the ARP (Aldehyde Reactive Probe) reagent that reacts specifically with an aldehyde group which is the open ring form of the AP sites. After treating DNA containing AP sites with ARP reagents, AP sites are tagged with biotin residues, which can be quantified using avidin-biotin assay followed by a colorimetric detection. The kit provides the necessary reagents for convenient determination of abasic sites in purified DNA sample in 96-well plate format. and agitation by a mechanical shaker at 200 revolutions per minute (rpm). air-dried and were visualized immediately or stored at 4ºC for later observation. representative images of each slide were acquired at magnification of 400× using a Leica Microsystems DM fluorescence microscope. and the slides were washed in S-buffer for 5 min. 8-hydroxy-2'-deoxyguanosine (8-oxo-dG) is a modified nucleoside, which is the most commonly studied and detected by-product of DNA damage, caused by oxidative radicals associated with inflammation, carcinogenesis, Parkinson's and Alzheimer's diseases, and also aging. 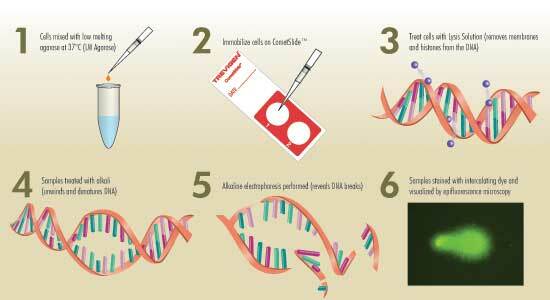 8-oxo-dG can serve as a sensitive indicator of physiological and environmental damage to DNA. This mouse monoclonal antibody is provided to enable the detection of 8-oxo-dG by ELISA, immunohistochemistry, or by immunocytochemistry. Freeze in working aliquots at -20°C in a manual defrost freezer to avoid repeated freeze-thawings. 1. Soultanakis RP, Melamede RJ, Bespalov IA, Wallace SS, Beckman KB, Ames BN, Taatjes DJ, Janssen-Heininger YMW. (2000) Flourescence detection of 8-oxoguanine in nuclear and mitochondrial DNA of cultured cells using a recombinant Fab and confocal scanning laser microscopy. Free Rad Biol Med 28:987-998. Description: This mouse monoclonal antibody specifically binds to 8-hydroxy -2’ -deoxyguanosine within DNA in H2O2-treated cells. It can be used to detect oxidative damage by ELISA (cat# 4370-096-K) and immunocytochemistry. Sufficient antibody is provided for approximately 50 slides, when a 1:250 dilution is used. Physical state: This antibody is provided as purified immunoglobulin from mouse ascites at 0.5 mg/ml in 1X TBS containing 0.1% sodium azide. freeze-thawing by aliquoting into smaller portions. Applications: Immunodetection of 8-oxo-dG by ELISA, immunocytochemistry, and immunofluorescence. 15 minutes each. Alternatively, cells may be fixed with 1:1 MeOH, acetone for 20minutes at -20°C . Allow to air dry. 4. Treat fixed cells with 0.05N HCl for 5 minutes on ice. 5. Wash 3x with 1X PBS, 5 minutes each. 6. Incubate with 250μl of 100μg/ml RNAse in 150mM NaCl, 15mM sodium citrate for 1hour at 37°C . 7. Wash sequentially in 1X PBS, 35%, 50% and 75% EtOH, for 3 minutes each. 8. Denature DNA in situ with 250μl 0.15N NaOH in 70% EtOH for 4 minutes. 9. Wash briefly 2x with 1X PBS. 10. Use 0.2 μg/ml (250μl) Hoechst 33342 (Immunochemistry Technologies, LLC) in 1XPBS to stain DNA for 10 minutes. 11. Wash sequentially in 70% EtOH containing 4% v/v formaldehyde, 50% and 35% EtOH, and 1X PBS for 2 minutes each. 12. Incubate in 250μl of 5μg/ml proteinase K in 20mM Tris, 1mM EDTA, pH 7.5 (TE) for10 minutes at 37°C . 13. Wash several times with 1X PBS. 14. Block non-specific binding with 5% normal goat serum in 1X PBS, 1hour at RT. 15. Wash 3x with 1X PBS, and incubate with 250μl anti-8-hydroxyguanine antibody at a concentration of 1:250 diluted in 1X PBS containing 1% BSA, 0.01% Tween 20 at 4°C o/n in a humidified chamber. • Applications- Kit contains the necessary reagents for convenient measurement of activity of Superoxide Dismutase (SOD) by colorimetric method. Superoxide dismutase (SOD) is one of the most important antioxidative enzymes. It catalyzes the dis mutation of the superoxide anion into hydrogen peroxide and molecular oxygen. The sensitive SOD assay kit utilizes WST-1 that produces a water-soluble formazan dye upon reduction with superoxide anion. The rate of the reduction with a superoxide anion is linearly related to the xanthine oxidase (XO) activity, and is inhibited by SOD (below). Therefore, the inhibition activity of SOD can be determined by a colorimetric method. WST Working Solution: Dilute the 1 ml of WST solution with 19 ml of Assay Buffer Solution. The diluted solution is stable for up to 2 months at 4C . Enzyme Working Solution: Centrifuge the Enzyme Solution for 5 seconds. Mix well by pipeting (The step is necessary, as the enzyme has two layers and must be mixed well before dilution). Dilute 15 l with 2.5 ml of Dilution Buffer. The diluted enzyme solution is stable for up to 3 weeks at 4C . 1. Blood samples: Collect blood using citrate or EDTA. Centrifuge at 1,000 x g for 10 min at 4C . Transfer the plasma layer to a new tube without disturbing the buffy layer and store at -80°C until ready for analysis. Remove the buffy layer from the red cell pellet. Resuspend the erythrocytes in 5x volume of ice cold distilled water and centrifuge at 10,000 x g for 10 min to pellet the erythrocyte membranes. Store the supernatant at -80C until ready for analysis. Plasma can be diluted approx. 3-10x and the red cell lysate diluted approx. 100x prior to SOD assay. 2. Tissue and cells: Tissue should be perfused with PBS or 150mM KCl to remove any red blood cells. Homogenize tissue or lyse cells in ice cold 0.1M Tris/HCl, pH 7.4 containing 0.5 % Triton X-100, 5mM β-ME, 0.1mg/ml PMSF. Centrifuge the crude tissue homogenate/cell lysate at 14000 x g for 5 minutes at 4C and discard the cell debris. The supernatant contains total SOD activity from cytosolic and mitochondria. Fractionation Kit. SOD activity is then measured from the Mitochondria and Cytosol fractions separately. *Refer to Table 1 for the amount of solution in each well. If you are using a SOD standard (not included with the kit), set up wells for it in the same manner as the sample. 1. Add 20 l of Sample Solution to each sample and blank 2 well and add 20 l H2O to each Blank 1 and Blank 3 well (See Table I). 2. Add 200 l of the WST Working Solution to each well. 3. Add 20 l of Dilution Buffer to each Blank 2 and Blank 3 well. 4. Add 20 l of Enzyme Working solution to each sample and Blank 1 well, mix thoroughly. Note: since the superoxide will release immediately after the addition of Enzyme working Solution to each well, use a multiple channel pipette to avoid reaction time lag of each well. 5. 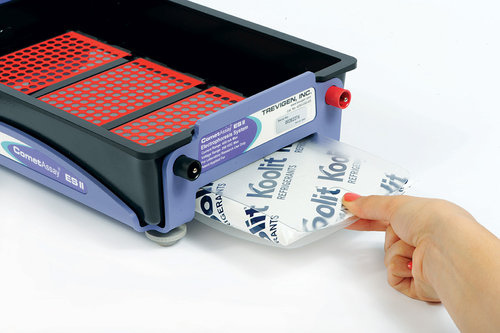 Incubate plates at 37C for 20 minutes. 6. Read the absorbance at 450 nm using a microplate reader. 7. Calculate the SOD activity (inhibition rate%) using the following equation. While histone acetylation provides increased accessibility of transcription factors to DNA, the deacetylation of histones is associated with transcriptional silencing. Oxidative stress is often defined as an imbalance of pro-oxidants and antioxidants. Oxidative stress and the associated damage to cellular lipids, proteins and DNA can contribute to a decline in cellular function, leading to a number of human pathologies. BioVision offers various convenient kits for analyzing transcriptional regulation, DNA damage, oxidative stress, energy transforming and redox state, and more are coming in the pipeline. 8-Oxo-2'-deoxyguanosine (8-oxo-dG), a frequently used biomarker of oxidative DNA damage, is removed from DNA by the base excision repair pathway, and subsequently transported into saliva, urine and plasma. In order to measure the total pool of 8-oxo-dG, Trevigen has developed a validated competitive ELISA kit that quantifies 8-oxo-dG in DNA, plasma, urine and saliva. Trevigen’s HT 8-oxo-dG ELISA kit II, employs a 96 strip wells pre coated with 8-oxo-dG, an anti-8-oxo-dG monoclonal mouse antibody, an HRP conjugated secondary antibody, and colorimetric detection substrate to construct a high throughput assay flexible for your experimental design. The 8-OHdG monoclonal antibody binds competitively to 8-oxo-dG immobilized on pre-coated wells and in solution. Antibody bound to 8-oxo-dG in the sample is washed away while antibody bound to 8-oxo-dG attached to the well is retained. Detection of the retained antibody is performed using an HRP conjugate and colorimetric substrate. Product formation is inversely proportional to the amount of 8-oxo-dG present in the sample. For the detection and quantitation of 8-hydroxy-2’-deoxyguanosine (8-OHdG) in DNA, plasma, urine and saliva samples. 1. Nunomura, A., Perry, G., Pappolla, M.A., Wade, R., Hirai, K., Chiba, S., and Smith, M.A. (1999) Journal of Neuroscience 19:1959-1964. 2. Sancar, A., Lindsey-Boltz, L. A., Unsal-Kacmaz, K., and Linn, S. (2004) Annu. Rev. Biochem. 73: 39-85. 3. 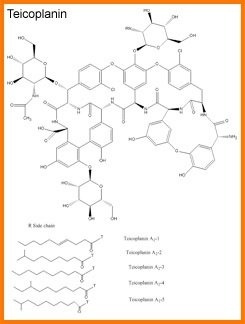 Wood, M. L., Dizdaroglu, M., Gajewski, E. and Essigmann, J. M. (1990) Biochemistry, 29, 7024-7032. 4. Marnett, L.J. (2000) Carcinogenesis. 21 (3): 361-370. 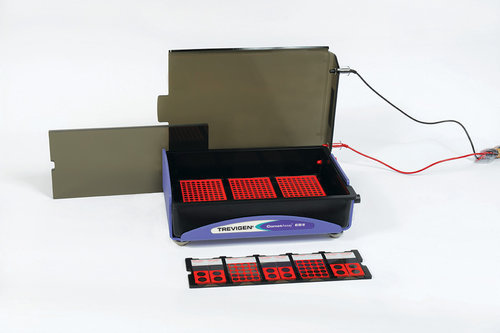 The comet assay tanks are available in four slide formats to study single cell gel electrophoresis (SCGE), a technique made popular by drug toxicology and carcinogenesis studies for the detection and quantitation of DNA damage in cells. Each tank’s robust construction from ebony acrylic ensures that cells remain free of exposure to background light and DNA damage during electrophoresis, while a cooled central platform provides a convenient surface for slide preparation and control of slide temperature during the assay. The single cell gel electrophoresis or CometAssay® is a state-of-the-art technique for quantitating DNA damage and repair from in vivo and in vitro samples of eukaryotic cells and some prokaryotic cells. In conjunction with Trevigen's new CometAssay® Electrophoresis System, which eliminates known causes of assay variability, it is the only technique that directly measures DNA damage in individual cells and as a result has rapidly gained importance in the fields of genetic toxicology and human biomonitoring. Samples stained with intercalating dye and visualized by epifluorescence microscopy following alkaline electrophoresis, which reveals DNA breaks. Trevigen is pleased to provide highly qualified enzymes, antibodies, and assay kits for DNA damage and repair research. As always, our products are accompanied by detailed product data sheets or instructions for use, and backed with expert technical support. DNA repair pathways maintain the integrity of the genome reducing the onset of cancer, disease and aging phenotypes. To further study repair pathways, Trevigen offers panels of human cell lines each deficient in proteins associated with DNA repair. The first panel consists of cell lines deficient for proteins in the Base Excision Repair Pathway. For the availability of other DNA repair deficient cell lines contact Trevigen. PARP-1 contributes to the sequence of events that occurs during DNA base excision repair. Trevigen offers kits that measure the in vivo and in vitro activities of PARP and PARG. The single cell gel electrophoresis or CometAssay® is a state-of-the-art technique for quantitating DNA damage and repair from in vivo and in vitro samples of eukaryotic cells and some prokaryotic cells. 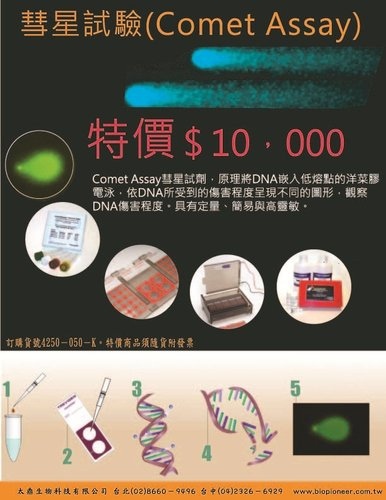 In conjunction with Trevigen’s new CometAssay® Electrophoresis System, which eliminates known causes of assay variability, it is the only technique that directly measures DNA damage in individual cells and as a result has rapidly gained importance in the fields of genetic toxicology and human biomonitoring. Trevigen’s unique FLARE™ Assays characterize DNA damage in single cells using a variety of DNA repair enzymes that recognize oxidative and UV damage in conjunction with Trevigen’s CometAssay® Electrophoresis System. A variety of DNA repair enzymes and antibodies are available as individual components with optimized assay conditions and buffers for research in areas of double-strand break repair, base excision repair, DNA methylation, oxidative damage, UV damage, and radiation damage. 1. Murray, N., L.A. Davidson, R.S. Chapkin, W.C. Gustafson, D.G. Schattenberg, and A.P. Fields. 1999. Overexpression of protein kinase C II induces colonic hyperproliferation and increased sensitivity to colon carcinogenesis. J. Cell. Biol. 45:699-711. 2. Bank, N., M. Kiroycheva, P.C. Singhal, G.M. Anthony, G.J. Southan, and C. Szabo. 2000. Inhibition of nitric oxide synthase ameliorates cellular injury in sickle cell mouse kidneys. Kidney Int. 58(1):82-89. 3. Li, X. and Z. Darzynkiewicz. 1995. Labelling DNA strand breaks with BrdUTP. Detection of apoptosis and cell proliferation. Cell Prolif. 28:571-579. 4. Gavrieli. Y., Y. Sherman, and S.A. Ben-Sasson. 1992. Identification of programmed cell death in situ via specific labeling of nuclear DNA fragmentation. J. Cell. Biol. 119:493-501. 1. Cooper, L.F., J.C. Tiffee, J.P. Griffin, H. Hamano, and Z. Guo. 2000. Estrogen-induced resistance to osteoblast apoptosis is associated with increased hsp27 expression. J. Cell Physiology 185:401-407. 2. Kasahara, Y., R. Tuder, L. Taraseviciene-Stewart, T. LeCras, S. Abman, P. Hirth, J. Waltenberger, and N. Voelkel. 2000. Inhibition of VEGF receptors causes lung cell apoptosis and emphysema. J. Clin. Inves. 106:1311-1319. 3. Gavrieli, Y., Y. Sherman, and S.A. Ben-Sasson. 1992. Identification of programmed cell death in situ via specific labeling of nuclear DNA fragmentation. J. Cell. Biol. 119:493-501. 4. Lovelace, C.I.P., J. Zhang, P.G. Vanek, and G.B. Collier. 1996. Detecting apoptotic cells in situ. Biomedical Products 21:76-77.